The annual College Hill 5K is here again! This time it’s under a slightly different name. 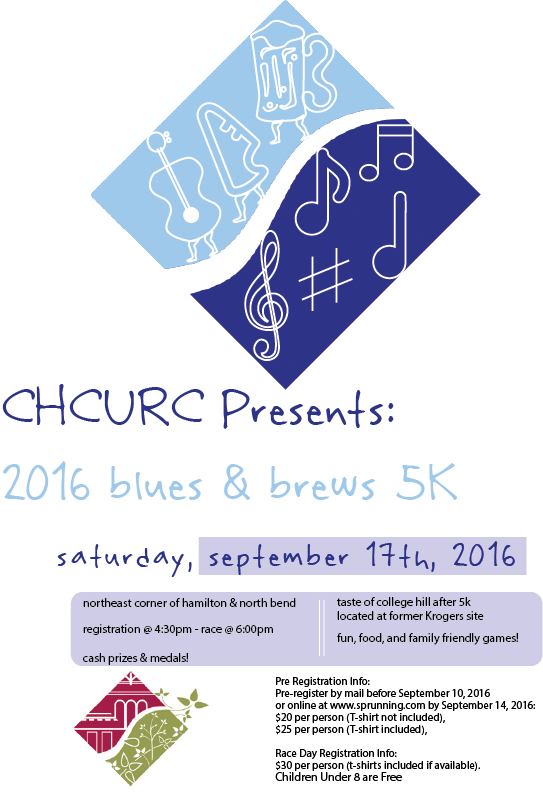 The Blues & Brews 5K is the natural growth to the previously named Rhythm Race. This year, things will be pretty similar – but just a little bit bigger. Instead of holding our after party in the Parking Lot behind our businesses, we will be celebrating at the future site of College Hill Station! With the bigger space comes bigger celebrations. There will be blues music, bluegrass music, games for kids, food trucks, food served by our local restaurants, and delicious craft and domestic beer. Join us on September 17th at 6:00pm. Whether you’re running, walking, or cheering on your favorite runner, it’s going to be a great time! Please mail in all registration forms one week before the race (September 10th). Online registrations are available to all individual runners and can be turned in before September 14th.